Today’s pallet industry is more than just about pallets. As time has evolved, there has been a real shift in focus among all stakeholders involved in pallets – from their manufacture, usage, distribution and recycling. We take a closer look at the shifts that have occurred, and the implications for those operating within the industry. Originally of course, the industry was primarily focused around the manufacture of pallets. Business customers wanted to be able to buy wooden pallets in a range of strengths, grades and sizes for a huge variety of commercial, industrial and even domestic applications. With the economy booming, pallets were in hot demand for logistics and freight solutions, transporting products from factories and manufacturing sites through to retailers, middlemen or value add suppliers in the chain. At this stage, pallets were primarily wood, and recycling was not particularly a feature of the industry – reflecting the wider times of boom and consumption. However, things shifted and there was a sudden move towards recycling. Businesses wanted to be able to operate in a way that was efficient, with leaner processes and a means to reduce their carbon footprint. This desire to become ‘greener’ in business meant that fewer customers wanted to buy wooden pallets that were new and made from virgin wood. 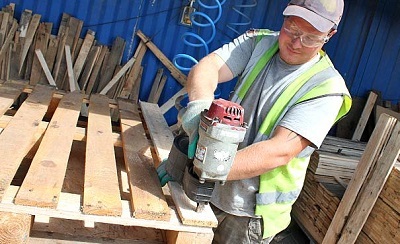 Instead of new wooden pallets, they were keen to make use of recycled material pallets, which helped them to improve their carbon credentials, sustainability credentials and cost management, and win new business and customers as a result of their approach to responsible business. Rather than simply creating one-off usage pallets, recycled products are now in widespread use, as well as pallets made from recycled plastics, sustainable woods, composite materials and other options. The environmental agenda is hotter than ever, as is the need for cost reduction and operational efficiencies. Customers exporting and trading abroad also want flexibility in the products that they purchase, meaning that manufacturers may be producing a mix of pallets, in the standard pallet size UK businesses demand, as well as Euro pallet dimensions. As we move through the year, the model is also becoming more service-oriented, with pallet related services now becoming key. Pallet businesses are realising that they have an opportunity to offer greater value than simple supply, and to provide valuable products and services to the broader supply chain as a whole. What this means for the industry? The pallet industry now has a real chance to offer more than simple manufacture and to become a genuine service provider for the supply chain,offering delivery, collection, order management, recycling and other services to win new business and prove value. It’s an exciting time for the industry, which is becoming increasingly more efficient and less wasteful. There are opportunities for better margins as a result of technology implementation, process streamlining and more efficient approaches to doing business in a modern way.